Tuesday June 23rd 1891 We finished the ironing in the forenoon and Mother went to town for the day. I wrote some in the afternoon. Ott was over a little while to see about the well. weather quite fine. Wednesday June 24th 1891 It was a very warm day. Mother went over to help Hatt put up cherries. I was working about the house and sewed a little. We were going after Mother & Father but they came home before we got started. Thursday June 25th 1891 I done a lot of sweeping up stairs this mroning and righted up the boarders rooms some. I done some sewing in the afternoon. We were going to town after supper but it rained a little.Will was in the valley fixing fence. Friday June 26th 1891 It was a very hot day. We worked with the carrots all day. I was suffering with my eyes I had taken cold and it had settled in my eyes. Will took the cattle to the valley late in the afternoon. Ott & Fanny were here in the evening. Saturday June 27th 1891 We put up more carrots this morning and I worked out of doors all forenoon. It was very warm. I was sewing in the afternoon. The girls came over from town and brought their supper with them. It come up a hard storn and Ott & Fanny staid all night. The rest of them went home. 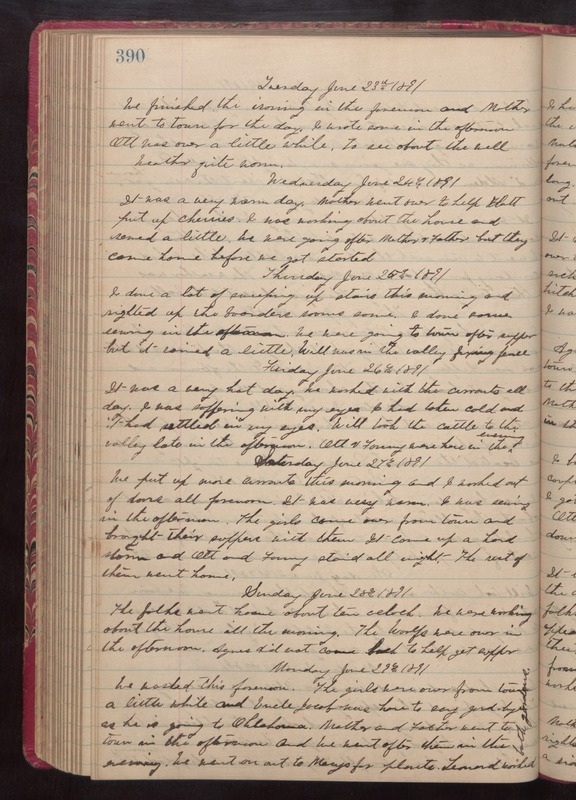 Sunday June 28th 1891 The folks went home about ten oclcok. We were working about the house all the morning. The Woolfs were over in the afternoon. Agnes did not come back to help get supper. Monday June 29th 1891 We washed this forenoon. The girls were over from town a little while and Uncle Jacob was here to say good-bye as he is going to Olahoma. Mother and Father went to town in the afternoon and we went after them in the evening. We went on out to Marys for plants. Leonard worked [the following text is written vertically in the right margin of the above entry] both gardens.